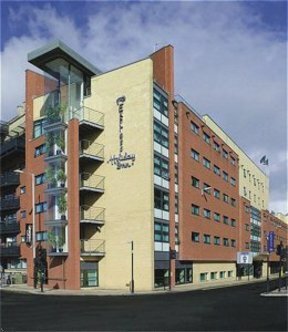 Stay at the fully air conditioned Express by Holiday Inn Glasgow Riverside and explore this vibrant, thriving city from your base in Glasgow City Centre.Our 128 guestrooms have been designed to provide all the comfort, convenience and value you have come to expect from Express by Holiday Inn. Accommodating up to 2 adults & 2 children, they each have air conditioning, satellite TV, high-speed Wireless Internet access and modern decor. From the moment you arrive at the Express by Holiday Inn Glasgow Riverside we want you to feel at home &reg arrive to a warm welcome, go to sleep in a comfortable bed and wake up to a delicious, complimentary continental breakfast.After exploring Glasgow&regs many museums, shops and attractions, why not wind down with a drink from our bar and a snack from our Vending area&regOur LocationYou can find us on the banks of the River Clyde, just a 5 minute walk from Glasgow Central Station, with St Enoch Subway Station closer still.Many of the city&regs attractions are within easy reach including George Square, the Merchant City, Strathclyde University, Peoples Palace, Glasgow Green, Scottish Exhibition and Conference Centre (SECC)Ibrox and Parkhead Stadia, the Science Centre and Imax Cinema.We are a smoke-free hotel however designated smoking guestrooms are available.Click here to book our Glasgow Sightseeing Package.